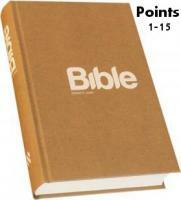 1 Scripture - The Bible, Old and New Testaments, are the written Word of God. Given by divine inspiration through holy men of God who spoke and wrote by the Holy Spirit. In this Word, God gave man the knowledge necessary for salvation. Scripture is the infallible revelation of God's will. The standard of character, the test of experience, the authoritative revealer of doctrines, and the trustworthy record of God's acts in history. 2nd Trinity - God is one: Father, Son and Holy Spirit, a unity of three persons from eternity. God is immortal, omnipotent, omniscient, sovereign and omnipresent. It is infinite and beyond human comprehension. However, it is known through his revelation. This includes his eternal honor, glory and service of all flesh. 3 God the Father - Eternal Father, the Creator, the Originator, Sustainer and Sovereign Lord of all creation. It is just and holy, merciful and gracious, slow to anger, and abounding in love and unwavering loyalty. Power and features manifested in the Son and Holy Spirit are also revelations Father. 4 Son of God - the eternal Son became man in Jesus Christ. Through him all things were created, revealed God's character, place the salvation of mankind and the world is judged by it. The eternal true God in Jesus Christ was a true man. Conceived by the Holy Spirit and born of Mary, a virgin. He lived and was tempted as man, and yet it was the perfect embodiment of God's justice and love. Its wonders of God's power manifested and proved that it is God's promised Messiah. Willingly suffered and died for us on the cross for our sins. He rose from the dead, ascended into heaven and is in the heavenly sanctuary in our behalf. He will come again in glory, forever to deliver his people and restore all things. 5 The Holy Spirit - God, eternal Spirit, involve with the Father and the Son in Creation, incarnation and redemption. He inspired the Bible writers. Filled the power of Christ's life. We invite and persuade people. Those who obey him, restores and transforms the image of God. Sent by the Father and the Son to be always with His children, is giving spiritual gifts to the church, empowers it to bear witness to Christ in accordance with the Scriptures it is put into all truth. 6th Creatures - God is the Creator of everything and brought the Scriptures reliable report on their creative work. In six days the Lord made heaven and earth and all earthly creation and rested on the seventh day of that first week. That established the Sabbath as a permanent monument to his finished work creator. The first man and woman were made in God's image as a masterpiece of creation. Received over the world and the responsibility to care for him. The world was completed after the creation of a very good and the glory of God preached. 7th The Nature of Man - A man and woman were created in God's image, individuality, and equipped with the ability to think and act freely. Although they were created as free beings, are dependent on God living and breathing and everything else. Every man is an indivisible unity of body, spiritual and mental effects. When our first parents disobeyed God, they denied their dependence upon him, and thus lost its lofty position under the rule of God. Image of God in them was breached and they became the prey of death. Their offspring inherit the fallen nature of its consequences are born with weaknesses and tendencies to evil. But God in Christ reconciled the world to Himself and by His Spirit restores in the fatal picture of people doing the penance of their Maker. Made for the glory of God are called to love God, love each other and care for their environment. 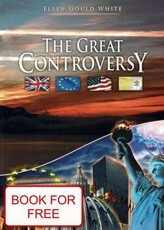 8 Great Controversy - All of humanity is drawn into the great controversy between Christ and Satan, which is the character of God, God's law and God's sovereign rule over the universe. The controversy began in heaven when one of created beings, endowed with a choice and began to elevate. She became Satan, God's adversary, which broke the resistance of the angels. He seduced Adam and Eve into sin, and said that the spirit of rebellion in our country. Sin has defaced the image of God in people, disrupted order in the creation of the world and caused havoc across the country flood. The creation observe our world, which became the scene of action space, at the end, God will love vindicated. To help in this case sends Christ to his people the Holy Spirit and the loyal angels, who are faithful to lead, protect and promote the way of salvation. 9 Christ's life, death and resurrection - the only means of atoning for human sin, God provided in Christ's life of perfect obedience to God's will, his suffering, death and resurrection. Those who by faith accept this atonement may have eternal life and the whole creation may better understand the infinite and holy love of the Creator. This perfect atonement defends law and justice of God's graciousness of His character, because it condemns our sin and gives us forgiveness. Christ's substitutionary death and purgative, reconciling and transforming. The resurrection of Christ proclaims God's triumph over the forces of evil and those who accept reconciliation, guarantees ultimate victory over sin and death. Announced by the government of Jesus Christ, before whom every knee will bow, in heaven and on earth. 10 Experience of Salvation - Of the endless love and mercy of God for us to associate sin with Christ, who did not know sin, so it is allowed to become righteous before God. Under the influence of the Holy Spirit, we are aware of their wretchedness, acknowledge our sinfulness, repent of their transgressions, and we believe in Jesus Christ as Lord and, as a representative of the pattern. This faith which receives salvation is generated by the power of God through the Scriptures and God's gift of grace. Through Christ we are justified, adopted as God's sons and daughters of God and deliverance from the dominion of sin. Through the Spirit we are born again and sanctified. The Spirit renews our minds, our hearts writes God's law of love and gives us power to live a holy life. If you're staying in it, we become participants of divine nature and have the assurance of salvation now and in the court. 11 Growth in Christ - His death on the cross Jesus triumphed over the forces of evil. As someone who during his earthly ministry conquer demons, broke their power, and sealed their ultimate fate. In Jesus' victory is our victory over the forces of evil that we are still trying to control, even with Christ living in peace, joy and the certainty of his love. Now we strengthen the Holy Spirit who dwells in us. Continuous casting Jesus as Savior and Lord frees us from the burden of past sins. You do not live in the darkness, fear of evil powers, ignorance, and worthlessness in the past life. Jesus, deliver us, calls us to continually grow in the likeness of his character with him daily to maintain concentration in prayer, we sowed his words to reflect deeply on his word and his mighty care to praise worship songs in common and to participate in the missionary task entrusted to the Church. If we take the service of love to those who live around us and we will see about his salvation, his constant presence through the Holy Spirit transforms every moment and every task in the spiritual experience. 12 Church - Church is a community of believers who confess Jesus as Lord and Savior. Following the Old Testament people of God are called to a world of shared worship, to enhance the community, to education in God's Word, to celebrate the Lord's Supper, for service to all people and worldwide evangelism. The Church receives its authority from Christ, the Incarnate Word, and the Scriptures, the written word. The Church is God's family, its members, adopted by God as His children, living under a new contract. The Church is a community of faith, Christ's body, whose head is Jesus Christ. The church is the bride, for which Christ died to be able to sanctify and purify. When he returns as a winner, it will be brought before the faithful of all ages, the purchase of His blood, it's a glorious church without spot or wrinkle, holy and without blemish. (Genesis 12.3; Acts 7.38, Eph 4,11-15; 3,8-11; Matthew 28,19.20, 16,13-20, 18.18; Eph 2,19-22; 1,22.23; 5,23-27; Colossians 1,17.18). 13th Remnant and its mission - The Universal Church is composed of all who truly believe in Christ. In recent days, a time of widespread apostasy, are the remains of the church called to keep God's commandments and the faith of Jesus. This remnant announces the arrival of the court hours, proclaims that salvation is possible only in Jesus Christ, and heralds the approach of His second coming. This proclamation is symbolized by the three angels of 14 Revelation. Concurrently with the court in heaven and on earth is the result of repentance and reform. Every believer is called to personally participate in this worldwide witness. (Revelation 12.17; 14,6-12; 18,1-4; 2 Corinthians 5.10, 3.14 Jude, 1 Peter 1,16-19, 3,10-14 2 Peter, Revelation 21 ,1-14). 14 The unity of Christ's body - The church is one body with many members that God calls on every nation, kindred, tongue, and people. In Christ we are new creatures. We may not share the racial, cultural, educational and ethnic differences, or differences between the noble and low, rich and poor, between man and woman. We are all equal in Christ, who by one Spirit we are united with each other and with each other, impartially and without reservation, we can serve each other. With the revelation of Jesus Christ in the Scriptures we share the same faith and hope and proclaim to all single witness. This unity has its source in the oneness of the triune God who has adopted us as His children. 15 Baptism - By baptism we confess our faith in the death and resurrection of Jesus Christ, and testify that we are dead to sin and we want to live a new life. Thus we acknowledge Christ as Lord and Savior, we become the people and are accepted as members of his church. Baptism is a symbol of our union with Christ, the forgiveness of our sins and that we have received the Holy Ghost. It is a confirmation of faith in Jesus Christ and a sign of repentance and is held by immersion in water. Baptism is followed by a thorough teaching of Scripture and acceptance of its teachings.